We understand the profound impact early education has on a growing baby. That’s why at Kiddi Kollege, we offer comprehensive infant classes throughout the Kansas City metro. 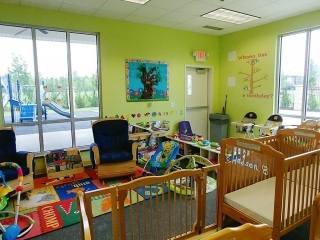 Our infant care program is more than a “day care.” We’re committed to providing a loving environment that lays the foundation of the child’s emotional, social, intellectual, and physical growth. Our infants receive personal, loving attention and care in an enriching environment to help your child build a strong foundation for development for years to come. We know that infants are continually learning about the world around them. That’s why our infant care curriculum is designed to support the development needs of children. Our infant care explores key developmental milestones as babies begin their lifetime of learning. We work alongside parents to ensure the individual, personal needs for each child is met. We provide a Teddy Folder that travels from Home life to school life each day. This journal helps with the daily communication as we work together for a common goal. Having infants learn the knowledge of basic sign language helps teachers and parents understand the needs of each child and decreases frustration in communication. We focus on the basic commands for example: more, please, thank you, all done.